The chocolate lava cake may have had its moment, but restaurateurs have long known that a sweet course at the end of the meal is the perfect way to leave a positive and everlasting impression on the customer, and capitalize on low-cost ingredients like sugar, flour and cream. Just take a look at the trendsetting pastry leaders across California’s spectrum. Many restaurants ease hesitant diners into Modernist Cuisine with wildly elegant sweet plates featuring unexpected twists. Dessert-focused bars and lounges are popping up in every major city and a select few are re-imaging dessert entirely, changing the typically plated dessert into a drink. From variations on the float to adult milkshakes to dessert-inspired cocktails, these restaurants diversify their menus with dessert drinks, all while appealing to the kid inside their diners. The team has turned the drink upside down for their Inverted Float, combining two scoops of root beer flavored gelato (made especially for the restaurant by San Francisco favorite La Copa Loca) with old-fashioned cream soda. Additionally, they’ve recently debuted another sweet drink, the Sangria Slushie. A combination of blackberries, strawberries, apples, oranges and lime soak in rosé wine and sake, next frozen to a snow cone consistency and then topped off with additional wine-saturated fruit. It would be no surprise if the slushie is just as popular with diners as the float has been since the opening of Straw. Case in point: the signature Michael Mina root beer float, a dish the chef has been serving since Aqua’s opening in 1991. A customer favorite, the float is now offered in a handful of Mina Group locations, including San Francisco’s Bourbon Steak and SeaBlue in Las Vegas. 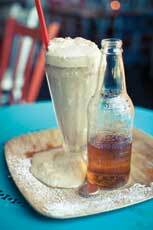 Served alongside warm double chocolate and chocolate chip cookies, the drink features alternating scoops of sassafras ice cream and root beer sorbet topped with IBC root beer. “It goes very much in line with a kind of home memory, that feeling you had as a kid,” says Lincoln Carson, Executive Pastry Chef for the Mina Group. These desserts certainly appeal to that clientele’s memory of childhood soda counters and malt shakes, but many restaurateurs improve those long-lost flavors with a splash of beer. At Los Angeles’ Wood & Vine, Chef Gavin Mills combines Guinness with Irish-Whiskey ice cream for an adult twist. And The Yard House in San Diego uses both Young’s Chocolate Stout and Lindeman’s Framboise to create beer floats. San Diego’s The Ritual Tavern goes one step further, blending the beer and ice cream into a grown-up shake. When owners Staci Wilkinson and her husband Michael Flores first purchased the property more than five years ago, the couple went through the equipment looking for usable supplies. A shake machine provided the inspiration to pair their favorite brews with ice cream. Now the restaurant regularly serves their rotating selection of draft porters or stouts blended with vanilla bean ice cream. Topped with Belgian dark chocolate shavings and a side of seasonal fruit, this grown-up shake is a crowd favorite, especially with beer drinkers. Although the featured beer changes weekly, “the roasted maltier beers tend to work better, because you get that coffee bitterness,” Wilkinson explains. So the restaurant uses everything from Coronado Blue Bridge Coffee Stout to Stone Belgo Anise Imperial Russian Stout to AleSmith Speedway Stout for their shakes. “The Imperial Russian Stouts are high in alcohol, so they get a little bit of a bittersweet flavor and a port-like, cherry sweetness,” says Wilkinson. Creative milkshakes run the gamut from these playful interpretations to the grown-up flavors, and many restaurants look to the bartenders for interesting dessert beverages. “I realized a long time ago that good coffee drinks in the winter blend excellently with vanilla ice cream for the summer,” says Scott Niesen, who started making ice cream cocktails in the mid-80s. As head bartender at Newport Beach’s Back Bay Bistro at the Newport Dunes Resort, he regularly serves three or four variations of the drinks, including a Raspberry Cheesecake blend and the Duck Quack, made with Kahlua, Bailey’s and Crown Royal. But the crowd favorite is the Oatmeal Cookie, a combination of vanilla ice cream, Goldschlager, butterscotch Schnapps and Bailey’s, topped with chocolate sauce and whipped cream. He says the key is the consistency: “If it’s too thick, the bartenders can’t make it, but you have to get it very thick, so it’s time consuming.” And when the 220-seat restaurant is going through a busy rush, making the drink can be a logistical challenge. “The bar and kitchen are on two ends of the space, and because you can’t keep ice cream at the bar, it can be difficult,” says Thomas Giulioni, Back Bay Bistro’s food and beverage director. But with the warm Southern California weather, Giulioni says the ice cream drinks are a major attraction at the resort. A handful of other restaurants are getting in the game, including the Mina Group, who serves a trio of adult milkshakes at Bourbon Steak’s Burger Bar. They use an old-fashioned shake machine and inspiration from classic cocktails, to lend this childhood favorite a more mature palate. Their trio includes a salty caramel and Jim Beam shake, a spin on the classic Grasshopper with chocolate liquor and crème de menthe and an Appleton rum and raisin mix. These dessert-inspired drinks are close in price and taste to top-notch cocktails, making them attractive for customers looking for a stronger finish. And for those who want to skip the last course, a shake or float can offer a refreshing taste without the heaviness of a whole dessert. But whether adding a drinkable dessert to the pastry menu or taking sweet inspiration behind the bar, expanding beyond the plate allows both creativity and customer satisfaction.